Eric L. Adams, as Brooklyn Borough President, was the honored guest speaker of the legendary STONEWALL Rebellion Veterans Association at its monthly meeting on Saturday, February 23, 2019 at 5 p.m. Meeting was co-chaired by the dynamic duo of Willson Henderson and AnDre Christie. The other Gay groups that had representatives at this up-front and personal sit-down with Mr. Adams were the G.L.B.T. Political Coalition and the PRIDE Democrats of New York City, whose president Steven Gradman and treasurer Sanjay Petersen live in Brooklyn. Coincidentally, at this same meeting were two candidates from Brooklyn, attorney Jared M. Rich, Esq., and community activist A. Tony Herbert, both running for New York City Public Advocate in a special election after this weekend. The venue was the Manhattan G.L.B.T. Community Centre in Greenwich Village, NY. Brooklyn Borough President Eric Adams hosts an important forum for the City of New York! The citywide public advocate of New York City succeeds the mayor if a vacancy occurs for whatever reason. Confirmed candidates tonight for Public Advocate include Jared Rich, Esq., community activist Anthony 'Tony' Herbert, and NYC Councilman Adrian Espinal, Jr., all from Brooklyn, in addition to Dawn Smalls, Esq., formerly worked for presidents Bill Clinton and Barack Obama, and Benjamin 'Ben' Yee, both from Manhattan, and NYS Assemblyman Michael Blake from The Bronx. There are no candidates from Staten Island. The one from Queens (who crazily boasted 'Bo Dietl' for mayor a year or so ago) was a no-reply. Representing the STONEWALL Veterans' Association is Willson Henderson and Ramon Bellido. On behalf of PRIDE Democrats is Mendy Seltza and Sam Weiss. This Public Advocate forum is on Tuesday, February 5, 2019, at Medgar Evers College on Bedford Avenue in Crown Heights, Brooklyn. Forum starts @ 6 p.m. In New York City, there is currently a vacancy in the citywide Public Advocate position. The special election is at the end of this month. Brooklyn Borough President Eric Lee Adams ("Bk-B/P") personally hosts a conference for the intended reunification and refocusing of G.L.B.T. organizations that are wholly or serving Brooklyn. Purposes include discussions of various issues with the groups as well as initial planning for the monumental "Stonewall 50" in Brooklyn next June! A winning majority of the invited groups participated namely the STONEWALL Rebellion Veterans Association (S.V.A.) appeared via Willson Henderson (born in Brooklyn) and Ramon Bellido (attends a weekly support facility in Brooklyn), the GLBTS Political Coalition represented by Rogers A. Hunt (lives and works in Brooklyn for decades), the Brooklyn LGBT Center covered by assistant director Jere Keys (also lives in Brooklyn), and the PRIDE Democrats of New York City represented by Steven L. Gradman (lives in Brooklyn and a former co-chair of Brooklyn LGBT Pride). The S.V.A. has led about a dozen Brooklyn Gay Pride parades with the famous 1969 convertible "Stonewall Car". The S.V.A. has also been a Brooklyn Pride Parade grand marshal! The productive and needed meeting was held in the grand conference room. In a disharmonious maneuver for the G.L.B.T. community, three of the organizations did a 'no show'. That's not unity. Imagine if one of the Germanys failed to show? Or one of the Viet Nams? That's not unity! Even the Koreas are incredibly on the path to reunifucation! This is proof of the fractured G.L.B.T. community in Brooklyn. The task of reunifying Gay groups in Brooklyn proved more daunting than the reunification of the two Germanys or the two Viet Nams!! However, as a Bk-B/P staffer pointed out, this is just the first meeting. Brooklyn Borough President Adams readily endorsed the proposal to have a Brooklyn Borough President G.L.B.T. Advisory Council as was done in all but one of the NYC boroughs. It will discuss and plan for GT.L.B.T. Pride Month. It will meet monthly through May 2019 in the Borough Hall classic conference room. In June is the Brooklyn B/P's annual G.L.B.T. commemoration at Brooklyn Borough Hall! Brooklyn Borough President Eric L. Adams 2018 Letter of Appreciation to the S.V.A. 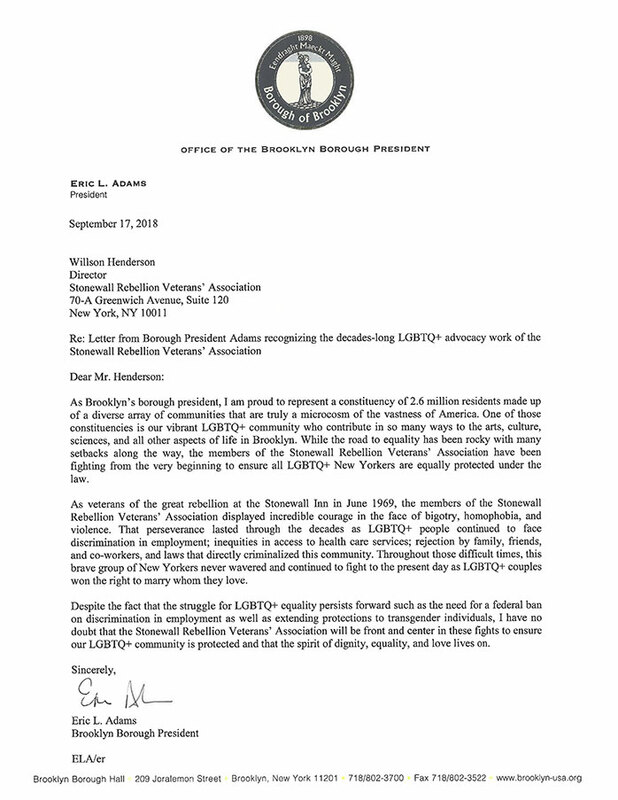 Brooklyn Borough President Eric L. Adams's letter of praise to the S.V.A. The meeting of the STONEWALL Veterans Association with the Brooklyn Borough President Eric Adamshappened on Monday, September 17, 2018. The agenda was wide-ranging from the various Stonewall veterans who live in Brooklyn and the SVA's interest in opening an auxiliary office in Brooklyn to the "STONEWALL-50" celebrations next June! The S.V.A. was represented by Willson Henderson (born in Brooklyn), Ramon Bellido (from Harlem) and AnDre Christie (previously lived in Brooklyn). Mr. Adams hosted the productive and interesting meeting in the Brooklyn Borough Hall's fabled, lengthy and grand conference room! BROOKLYN, NY, June 9, 2014: Brooklyn Borough President Eric L. Adams hosted board members from Brooklyn Gay, Lesbian, Bisexual and Transgender (G.L.B.T.) Pride in the rotunda of Brooklyn Borough Hall to proclaim the week of June 9 to 14th, 2014 as “Brooklyn Pride Celebration Week”. The event featured the raising of the G.L.B.T. rainbow flag inside of the building; the flag itself will be openly displayed atop Brooklyn Borough Hall for the duration of the week. B/P Adams was impressively also joined by war veterans Jeff Malone, a U.S. Army Specialist who performed the presentation of colors, and Taylor Anderson of the U.S. Air Force, who sang the American national anthem. Brooklyn G.L.B.T. Pride’s 18th Annual Pride celebration, “Coming of Age”, celebrates the innumerable cultures, races and ethnicities that congregate and define Brooklyn. It has grown to become the largest and most prominent organization serving Brooklyn’s G.L.B.T. community. Although Brooklyn Pride’s primary mission is to produce the borough’s annual Pride events, the organization actively works to bring pride year round to every Brooklyn neighborhood. Handsome Brooklyn Borough President Eric L. Adams speaks at start of Brooklyn Pride Week at Brooklyn Boro Hall. Brooklyn Borough President Eric L. Adams joins members of Brooklyn Pride and other Gay organizations serving Brooklyn’s G.L.B.T. community, including the Ali Forney Center, the Brooklyn Community GLBT Pride Center, the Circle of Voices, Gay Men of African Descent (GMAD), the GRIOT Circle, and the Hetrick-Martin Institute home of the Gay High School, at his kick-off of Brooklyn G.L.B.T. Pride Week at Brooklyn Borough Hall. Gay Pride Note: Conspicuously and inexplicably absent was the STONEWALL Rebellion Veterans Association (S.V.A. ), whose members largely "ignited the modern G.L.B.T. rights movement"! Ironically, the SVA's founder and director was born in Brooklyn and he has lived in NYC for six-plus decades! For about a dozen years, the S.V.A. with the famous blue 1969 convertible filled with veterans of the landmark STONEWALL Club in Manhattan generously and proudly led the nighttime Brooklyn Gay Pride Parade! District 22 (Bay Ridge, Dyker Heights, Bensonhurst, Fort Hamilton, Gerritsen Beach)!